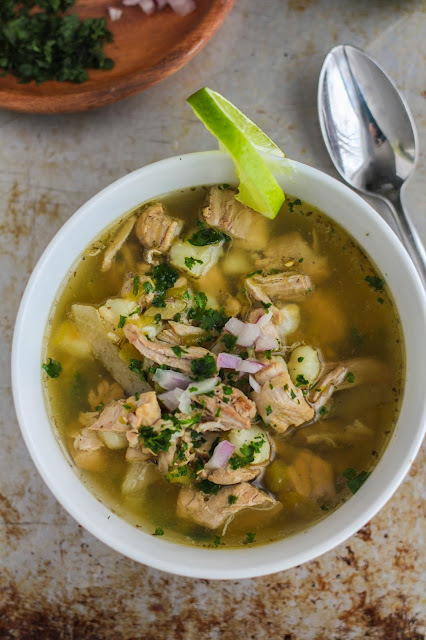 This flavorful Mexican stew features tender pork, green chiles and hominy, and is made in the slow cooker. Delicious, warm, and spicy, it's the perfect game day dish! Well, winter has definitely arrived in Michigan! Snow, wind, and dreadfully cold temperatures means my favorite place right now is snuggled up on my couch with my favorite blanket. While I'm all cozy on the couch, you'll probably also find me watching football. I love this time of year when the weather is frightful and the football playoffs are on. There's no place I'd rather be than with my family watching the big game! Of course while we are spending the weekend watching football we have to eat delicious food. Cold weather calls for comfort food, in my opinion. A big pot roast, a pot of soup, I want it all. 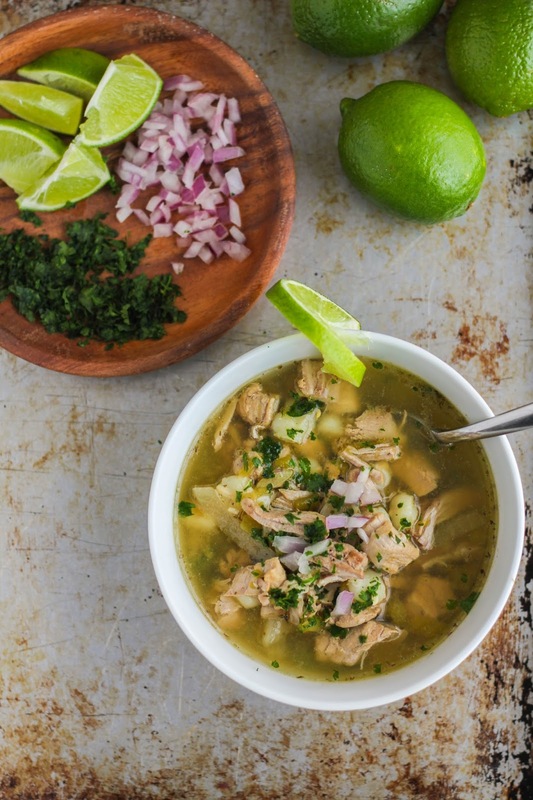 This Slow Cooker Spicy Posole Verde is my new favorite dish, especially while watching football. It's warm and spicy and full of amazing Mexican flavors. 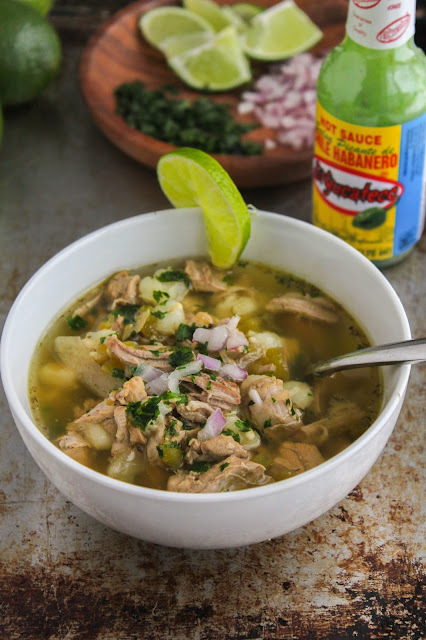 Pozole (or posole) which means hominy, is a traditional Mexican stew. Posole can be made many ways but it's basically made from hominy, meat (traditionally pork), and different chile peppers. My version contains green chiles and El Yucateco Green Habanero Hot Sauce, which gives the stew a nice kick! Although the stew is spicy, it's not that spicy. My kids ate it, loved it, and asked for seconds. El Yucateco Green Habanero Hot Sauce is made with fresh green habanero peppers, garlic, spices and seasonings, and has a fresh, crisp flavor. 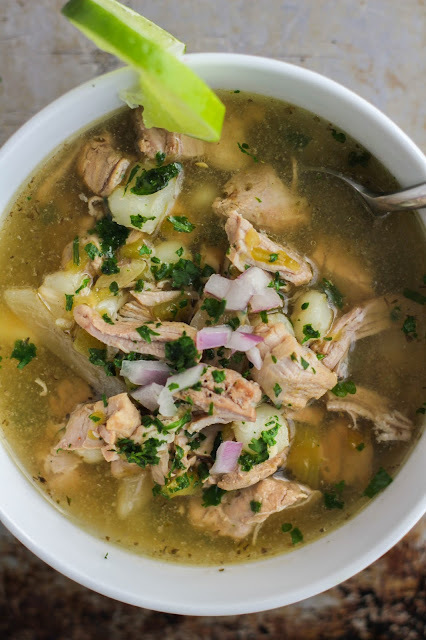 It adds just the right amount of zesty flavor to the posole! This dish is perfect for the football playoffs, and even great for a weeknight dinner with the family. Put everything into the slow cooker in the morning, and when you come home for dinner you'll have a wonderful and warm meal ready to go. I love to serve warm flour tortillas with the stew, that way you can dip them into the broth and soak up all the flavors! Do you have a favorite fun and flavorful slow cooker recipe? Share with me in the comments below! Now, let's make some posole! Heat a large nonstick skillet over medium-high heat. Add the oil to the pan and turn to coat. Add the pork pieces to the pan and season with salt and pepper. Cook until the pork is browned on all sides, which will take about 10 minutes. Combine the pork and the remaining ingredients (not the toppings) into a 6-quart slow cooker. Cover and cook on low for 8 hours or high for 4 hours. Ladle the posole into bowls and top with chopped red onions, a sprinkle of fresh cilantro and a squeeze of lime. I love shopping at my local Meijer store and found everything I needed for this posole there! 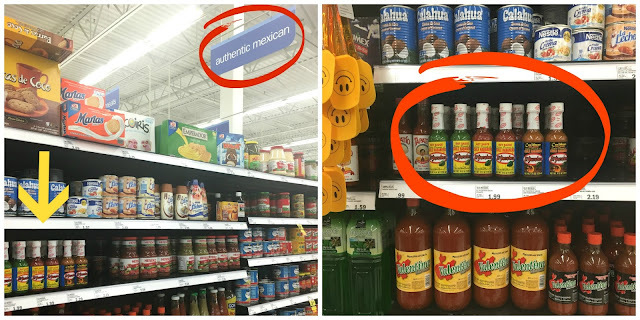 The El Yucateco sauces are located in the International aisle, with the Authentic Mexican foods. Also, be sure to check out the El Yucateco gear store where you can find lots of cool gear to show your El Yucateco love! The El Yucateco gear store offers men and women's apparel including board shorts for the summer, hoodies for the winter, and even embroidered t-shirts!